It's been a while, but we're back in LEGO Technic country once more. In the past we've reviewed huge crawler cranes, speedy racing cars, and complicated diggers, but today we're checking out not only one of the most impressive Technic sets ever released, but also the largest we've ever assembled. 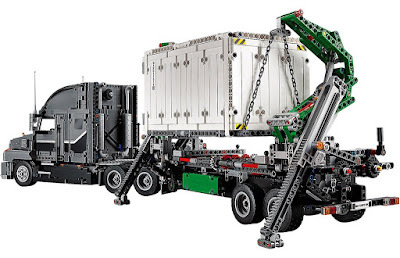 We take a look at the LEGO Technic Mack Anthem Truck. This thing is not small. Just shy of a metre in length it is by far the most space-sucking LEGO build we've ever seen, and definitely the most realistic looking. Most of the build time, and just over half of all parts, goes into the Mack Anthem itself. The truck is detailed, well proportioned and uses quite a lot of traditional LEGO studded parts, especially around the front. Obviously all six wheels roll, and there is steering control over the forward two. This thing looks great from all angles, but here you can see the complicated lines and curves of the engine bay. Note also the use of stickers and the unique golden Mack hood ornament. Details also include the exhaust pipes, partially concealed fuel tanks below them, and the rear lights and number plate. Steering is handled by that little black cog near the top. Open up the hood and you'll see the engine within. 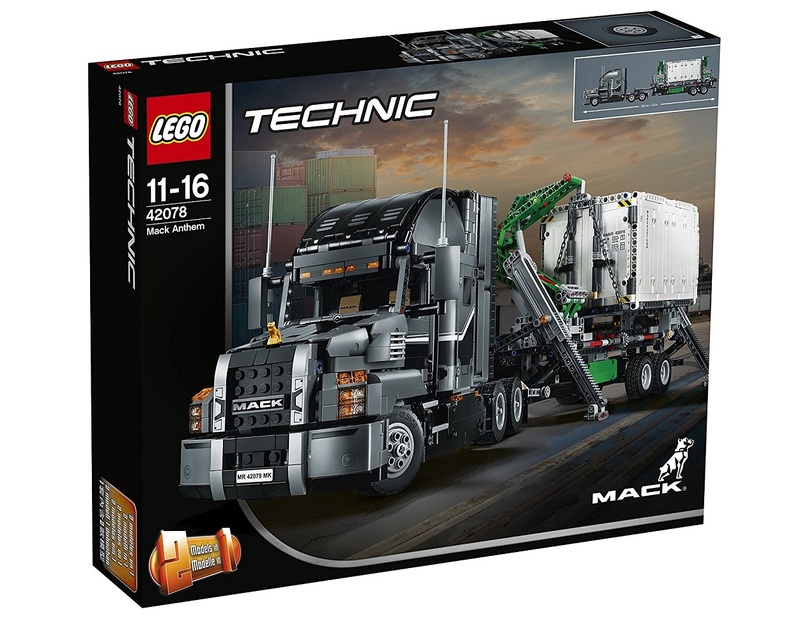 Roll the LEGO Technic Mack Anthem Truck along the ground and those pistons will actually pump up and down, while the radiator fan up front will also spin. ... a bed. You build it into the rear of the cabin, but then build almost entirely over it, meaning you can see it only by removing the truck's roof - not something easy to do. 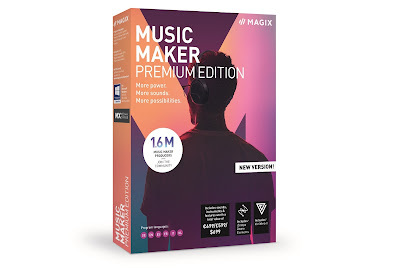 Weird, but okay. The trailer attaches to the truck by way of a sliding lock, meaning it is both very secure while rolling around, and easy to unhook. ... outriggers. These extend in one swift motion and lock into place, making the trailer more stable and shifting the centre of balance out to the side. Then you start twisting the knobs to lift the cargo container. There are two; one that controls the lower half of the crane, and another for the upper section to which the chains attach. It takes a bit of practice to get the balance right, making the whole movement as smooth as possible. Looks great though, and very realistic. All the way to the ground the trailer doesn't tip up in the slightest, although that is with the container empty. Fill it, and the movement may become a tad wobbly. Interestingly, the chains attach to the container with just a single stud each, and yet it is still very securely anchored in place. Speaking of the container, it's a whole build in itself that wasn't as quick or as easy to assemble as we first assumed. It features some nice details from the stickers, and the two doors can lock into place to keep them closed. There's also loads of space inside to accommodate things you might want to transport around your living room carpet. In case you were wondering about scale, check out the (tiny from here) LEGO minifigure standing by the closest outrigger. This definitely isn't minifigure scale at all (unlike the crawler crane) but the older target audience of teens and adults will still get a lot out of it. So a fun and intensive (not to mention lengthy) build results in a fantastic model of a pretty famous vehicle. To be honest, we think collectors might only be interested in the truck part itself, and could stop building before tackling the crane trailer, but altogether this is impressive, detailed, and has lots of fun features. The LEGO Technic Mack Anthem Truck is a great set.